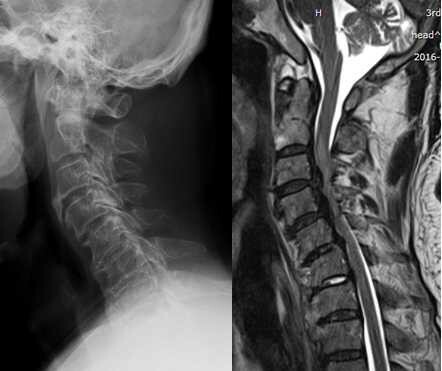 Objective: This retrospective study investigated the incidence and risk factors of poor clinical outcomes after cervical surgery for cervical spinal cord injury in a large population of patients with global or segmental cervical kyphosis. Methods: The clinical and radiological evaluation results of 269 patients with cervical kyphosis who underwent either anterior or posterior surgery between 2008 and 2013 were collected, preoperatively and at each follow-up after surgery. Results: All patients were followed for an average of 2.5 years. Outcomes were classified as good or poor (n=156 and 113 patients, respectively), based on the Japanese Orthopedic Association (JOA) recovery ratios. The rates of patients with good or poor outcomes were statistically comparable with regard to gender ratio, type of injury, history of diabetes or cardiovascular disease, interval between injury and surgery, and follow-up time. The multivariate logistic regression analysis indicated that the following were independent predictors of poor improvement: patient age (P=0.016, odds ratio [OR] =1.0261); preoperative JOA scores (P=0.003, OR =0.1932); and cervical instability (P=0.004, OR =2.1562). Conclusion: This study showed that advanced age, low preoperative JOA score, and cervical instability are closely associated with a poor surgical outcome in patients with cervical kyphosis. However, these results do not suggest that the type of cervical kyphosis influences the clinical outcome of surgery.